How do I view old Tasks and Assessments? It can be helpful for you to look back at old tasks or assessments that your students have completed to view progress and make comparisons to recently completed tasks and assessments. The following guide applies to Assessments and Tasks & Homework — the steps should be almost identical for each section. To view the previous tasks for an active class, go into the Tasks & Homework or Assessments section on your Control Panel. Next, click the drop-down menu and select the time frame that you would like to view tasks or assessments for. This will show you all the tasks and assessments for this time frame. If your class is from a previous year, or is no longer in your school's list of classes, you will need to retrieve your class first. To do this, click the Manage Accounts tab on your Control Panel. Select Archived. Once you have located the class, select the three dots next to the class name and then Unarchive Class. For more information about retrieving your classes, you can read through our article here. 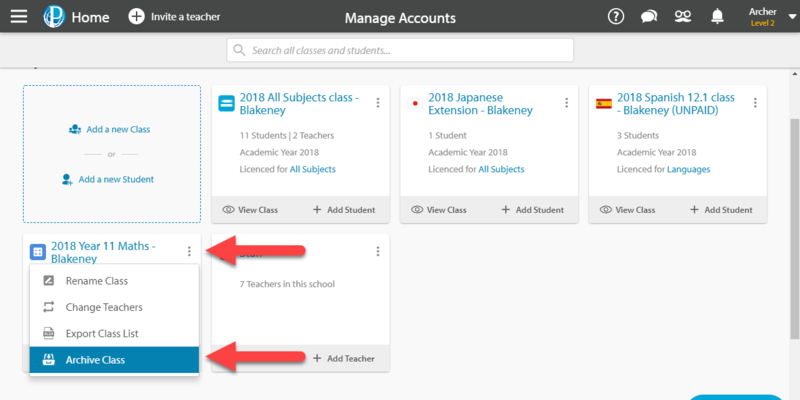 Once you are finished looking at these previous classes, you can archive the class again by going back into Manage Accounts. For more information on how to do this, you can read through our article here.